The Bulls Sunday were about to blow a 19-point late third quarter lead to the Los Angeles Lakers, the Lakers on a 7-0 run to open the fourth quarter to cut the Bulls lead to 77-69. And though the Lakers were depleted with injuries, they’re fourth in the league in three pointers made and can erase leads quickly. But what was once a brisk Bulls offense with a 34-23 first quarter had ground down with a miss from Mike Dunleavy, another from Tony Snell and one from D.J. Augustin, the Bulls best shooters, however limited that list is. Jimmy Butler added his own sideways attempt and now instead of the ball finding energy it was finding hesitation and desperation. Time for a big shot, a run stopper. 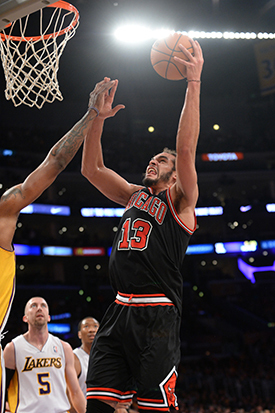 “That was nice, very nice jump shot,” said Noah of his 13 footer that stopped the Lakers’ run and provided the impetus toward a 92-86 Bulls victory. “I was very happy with it. I was open and I knocked it down. No hesitation. Left the follow through up and made it. And big for the Bulls as Kirk Hinrich, coming out of a long shooting slump, followed with his third three pointer of the game, Noah added a driving dunk that awakened even the cool Lakers audience and scored six of the Bulls first 11 points of the quarter as the Bulls closed their last, long Western Conference trip at 3-3 and back to .500 for the season at 25-25. “We’re not satisfied being .500,” said Noah. And going through the Western Conference with wins in San Antonio and Phoenix and closing out almost two weeks on the road with a win in Los Angeles despite the Lakers winning their last two, the Bulls, if not sending shivers down the spines of the Eastern leaders, are making their own case not to be ignored. It’s one of the promising clichés in sports, but there’s a strong belief these Bulls seem to have in possibilities. Few have endured as much with the loss again of Derrick Rose for the season and trade of Luol Deng. But Gibson has grown as a post player averaging more than 18 points in his eight starts when Boozer or Noah were out. Gibson got the Bulls off to that strong start with a dozen first quarter points battering the Lakers interior. Then there was Hinrich with a second straight good shooting game, seven of 13 after seven of 11 against the Warriors. Hesitant with his shot much of the season, Hinrich has aggressively taken his shots on this trip and it’s opened up offense as he had 17 points Sunday. And while it generally has been defense — second ranked in league efficiency — it got the defensive play of the game from Augustin, not one of the stronger defenders. But with the Lakers led by Chris Kaman with a season high 27 points making one last push to get within 88-84 with 48.9 seconds left, it was Augustin after missing a jumper hustling back to steal a pick and roll bounce pass from Steve Blake to Kaman that looked like it would draw the Lakers within two. It effectively ended the game as Augustin with 15 points and six assists closed with free throws. But it was Noah who got them there once again. 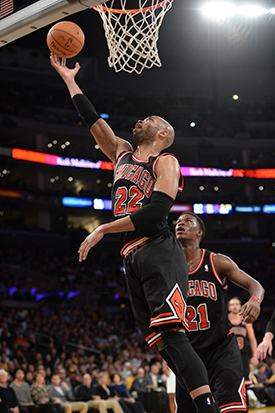 He led the Bulls with 20 points, 13 rebounds, three blocks and two steals. And he played the last 6:53 with five fouls, helping, nevertheless, to thwart Kaman and Jordan Hill inside. Because the Bulls, although Thibodeau never would admit such as we know, are pretty much lost without Noah. Gibson’s become a viable offensive option and Hinrich looks like he’ll complement the shooting of Dunleavy and Augustin. Butler has become one of the better rebounding guards in the league and Boozer when healthy has been reliable. He is averaging 13.3 points, 12.3 rebounds and 5.3 assists since his ejection/meltdown in Sacramento, and the numbers barely tell the story of the team’s emotional and spirited leader. He’s perhaps the unlikeliest star on an unlikely team, though Noah perhaps best symbolizes this Bulls team that gets by on trying harder than the other guy when he’s trying his hardest. The Bulls opened up taking advantage of Gibson’s aggressive play inside against a Lakers team that had Steve Nash back, albeit temporarily as he went out again later when his body acted up. It’s unfortunate because we may be seeing the last of one of the great shooters and playmakers ever. Though many diminish Nash’s two MVP awards and excellence, his pure, efficient game has been one of the highlights of the last decade in the NBA. Though there’s not much left and no Lakers starter would score in double figures. It was the sort of first quarter you may have been adjusting your vertical hold — check a history book — to see who were those guys wearing Bulls uniforms with 60 percent shooting and a 13-point lead seven minutes into the game. But the Bulls can have a drought in a reservoir as the Lakers behind Kaman powering inside ran up a 12-0 spurt to make it a game in getting within 52-46 at halftime. The Bulls shot 38 percent in the second quarter, which was something of a relief as you knew that was your Bulls. The Bulls got on a nice run after halftime with Hinrich’s shooting and Noah mixing it up inside and off the boards to take a 77-62 lead heading into the fourth quarter. It’s been one of the more remarkable stories in the NBA, not that the Bulls are threatening any championship predictions. But they have not gone away like they were supposed to even with their own inefficiencies. And led by a player whom even their own coach won’t assign any scoring plays. And there he was again. Legs like jelly at the end of almost two weeks on the road for several; perhaps confidence and certainty waning a bit. Noah caught the pass on the left side above the free throw line. The Lakers’ defenders stared at him. Mission accomplished: Noah had to shoot. He did to give the Bulls back a 10-point lead, the first Bulls points of the fourth quarter after almost four minutes. Kaman answered, but then Hinrich stepped up aggressively for the three and 82-71 lead with 7:41 left. Noah then committed a turnover and on the next Lakers’ possession with just under seven minutes remaining Noah committed his fifth foul. Thibodeau knew the 3-3 trip was important, and so he needed Noah. He decided to ride it out. And Noah, predictably, was imploring Thibodeau to keep him in the game. Noah almost immediately responded with a driving dunk shot. And Butler, though still struggling shooting and taking a kick in a sensitive area, stood back up for a strong driving layup a couple of big rebounds in traffic among his nine that had the look of someone thinking, “If no one is going to get it, I better.” Though Butler’s offense remains erratic, he continues to make physical plays despite another 40-plus minutes. Gibson took a shot defending the curiously little used Kaman with Noah having the five fouls. But the Lakers got within four and it was Augustin stepping in to save the day as Mighty Mouse once did. Yes, these Bulls turn up in the most unexpected places.